A-Level law students across the country are taught a complex, but rewarding subject in the classroom. But outside of college there is little in the way of extra help. 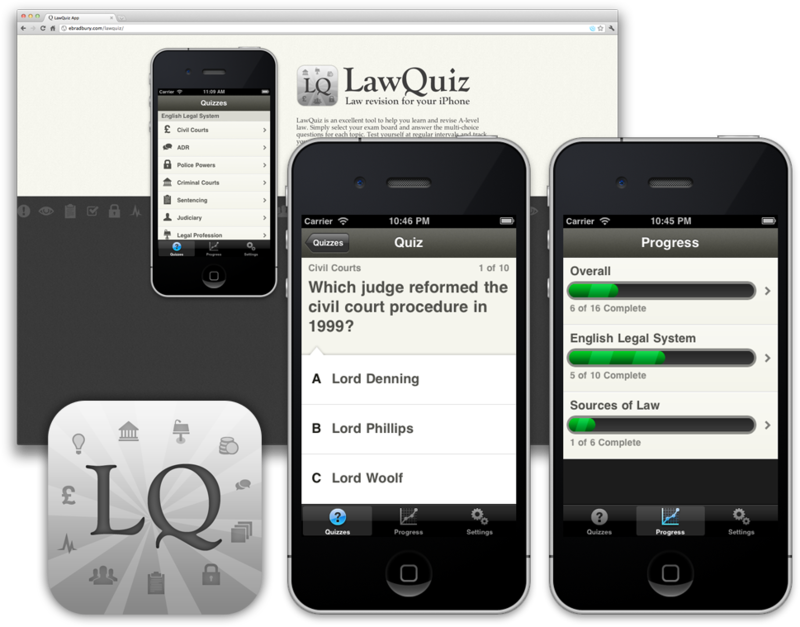 That’s why teacher Emma Bradbury came up with the idea of LawQuiz – an app for the iPhone that contains a number of quizzes on all the different topics on the exam. And so, using a simple structure I helped bring to life a helpful revision aid for students of law. The app allows users to track their progress and review their performance by showing what questions they got wrong, and telling them the right answers. To finish development I created a micro-site for the app to show it off to any prospective buyers who wanted a little more info. And so now students have a valuable resource in an area of study that previously had none. Technical Details: App created in Objective-C using primarily coded views. Website created using HTML5 and CSS. Icon and all mockups done in Photoshop.